FILE - Turkish President Recep Tayyip Erdogan and his Iranian counterpart, Hassan Rouhani, hold a joint news conference after their meeting in Ankara, Dec. 20, 2018. Turkey is heralding as groundbreaking a joint military operation with Iran against Kurdish rebel groups. Turkish-Iranian relations have markedly improved, to the concern of Turkey's Western allies. Coordinated and concurrent military strikes against "terror groups" were carried out along the "borders of the two countries," read a statement by the Iranian Interior Ministry, released Wednesday and reported by Turkish media. The announcement came two days after Iran, through military sources quoted by the Fars news agency, denied involvement. The Turkish interior minister, Suleyman Soylu, announced the operation Monday, declaring it "a first in history." The operation targeted the Kurdistan Workers' Party, or PKK, which is fighting a decades-long insurgency for greater minority rights in Turkey. 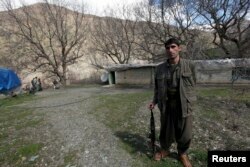 Ankara has long courted Tehran's support in its war against the PKK. The rebel group has used Iranian territory to enter Turkey from its main bases in Iraq, located near the Iranian border. According to former senior Turkish diplomat Aydin Selcen, Tehran's support would be essential in targeting the PKK's headquarters in Iraq's Qandil mountains. FILE - A Kurdistan Workers' Party (PKK) fighter stands guard at the Qandil mountains near the Iraq-Turkish border in Sulaimaniya, 330 km (205 miles) northeast of Baghdad, March 24, 2013. "Iran is geographically important because the entry to Qandil is on the Iranian side, as Qandil is a complex mountainous region that is almost inaccessible," Selcen said. Selcen opened Turkey's consulate in Iraq's Kurdish region and served in Baghdad, spending much of his time working on countering the PKK. Selcen has voiced skepticism about Ankara's claims of a breakthrough with Tehran in Ankara's war against the PKK. "I don't find it realistic that such a [joint] operation took place. We have always heard for years that Iran will offer such cooperation, and it never happened. Because Iran has its problems with its Kurdish population, they would prefer to keep their own Kurdish region quiet," Selcen said. The PKK has an Iranian wing called PJAK, which in recent years has mostly avoided confrontation with Iran's military forces. The deepening bilateral relations coincide with a souring in ties between Turkey and the United States. Turkey is angered by America's support of the Syrian Kurdish YPG militia in its war against Islamic State. Turkey claims the YPG is affiliated with the PKK. Turkish and U.S. military officials are in talks over the creation of a security zone in Syria to protect Turkey's border from the YPG. 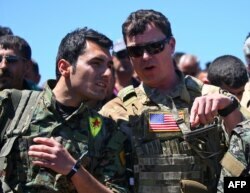 FILE - A U.S. officer from the U.S.-led coalition speaks with a fighter from the Kurdish People's Protection Units (YPG) at the site of Turkish airstrikes near the northeastern Syrian Kurdish town of Derik, April 25, 2017. "It's a credible idea if you are sitting behind your desk in Ankara," said Selcen. "But whether such a move will have much effect today on the U.S., I am not so sure, because Turkey and U.S. relations as they are right now have enough troubles. ... So it could be quite a risky strategy." "We get no trading favors from either Iran or Russia, and that does not surprise me," said analyst Atilla Yesilada of Global Source Partners, a business management consultancy in New York. "Iran and Russia understand a more prosperous Turkey would invade their markets and would eventually become a political rival to them." "I don't know if it [the new legislation] is specifically against Turkish imports, but in reality, it does affect a lot of Turkish imports into Iran," said Yesilada. "I have spoken to dozens of businesses who told me Iranians had not granted any favors to Turkish businesspeople." Similar skepticism has been expressed in the past by Turkish officials regarding Tehran's commitment to assisting Ankara in combating the PKK. "They always talk about cooperation, but when it comes to it, they do nothing," said a senior Turkish counterterrorism official, who asked not to be identified. Turkish government ministers in the past went as far as accusing Tehran of supporting the PKK in a bid to weaken Turkey.